There’s no reason to cause your family and friends additional stress by having them make last-minute funeral arrangements after you pass away. With an End-of-Life plan, you can outline exactly how you want to be remembered. Find out more in this post. Thinking about your final days—let alone planning them—can be unsettling. But, putting off answering important questions, such as what will be done with your remains after you pass away, can result in your grieving relatives and friends having to do it for you. In this post, we briefly cover what an End-of-Life Plan is and how it helps individuals outline their own memorial plans and lessen estate planning responsibilities for their family and friends. An End-of-Life Plan is an estate planning document that allows you to communicate how you wish to be remembered by your loved ones and how you want to be laid to rest when you pass away. For a well-rounded estate plan, an End-of-Life Plan is used in conjunction with a Last Will and Testament—a document that allows individuals to specify how they want their estate to be distributed after they pass away. With both documents, you leave a straightforward plan of how to handle your estate for family and friends to follow. What should I put in my End-of-Life Plan? An End-of-Life Plan is an all-purpose document that helps you arrange your end-of-life announcement, funeral, service payments, and more. How your death will be announced to others: An obituary or death notice works for some people, but some prefer not to publish any announcement whatsoever. If you want an announcement, determine how you want people to find out about your passing—you can even write specific statements to include in your notice. Remember, this is your last hurrah; don’t be afraid to personalize it. How your remains will be handled: This topic can be difficult for some to discuss, but it is essential to end-of-life planning. A person can be buried, cremated, or entombed, to name a few options for remains. You can opt for a more traditional burial, such as being buried in a family plot, or you can try something new, like one of the environmentally-conscious methods listed in our blog about green burials. Whatever you decide, be sure to include it in your document. The type of service you want to take place: Beliefs, traditions, customs, and culture can influence the type of service a person wants. Just like your announcement and remains, the service you choose should resonate with you. Include your decisions in your plan, and let your loved ones concentrate on mourning your passing instead of planning your service. How your announcement and service will be paid for: Nearly everything you arrange in your End-of-Life Plan is going to cost money—and some payment amounts can be quite significant. Give your family peace of mind and be sure to detail how your arrangements will be paid for in your plan. Why should I create an End-of-Life Plan? There’s no reason to burden your family during a difficult time by making them sift through various funeral or burial options. Instead, use an End-of-Life Plan to detail exactly how you want to be memorialized and let your family focus on celebrating you and your life. 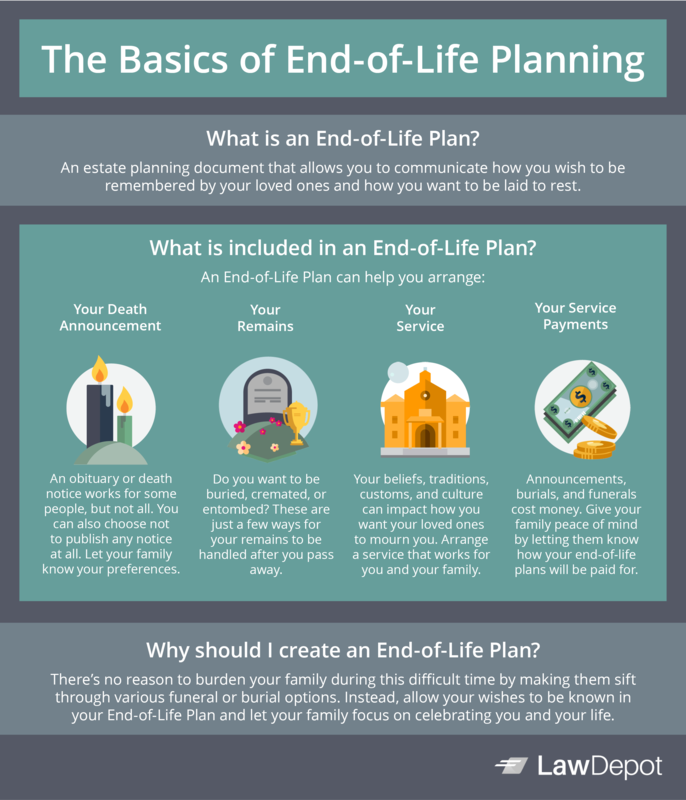 Share our Basics of End-of-Life Planning infographic with your friends and family!